John Dalton: English scientist who formulated the modern day atomic theory, defining that matter was made of infinitesimally minute particles which dictated characteristics of each form of matter. Think of him as the Watson and Crick of matter—while he didn’t come up with the structure of the atom, he defined its DNA. All elements are made of tiny particles called atoms, each of which has specific characteristics of that element. Atoms of each element are identical to one another. Atoms of different elements are different. Compounds are formed from two or more elements (or types of atoms), chemically combined in a fixed ratio: The Law of Definite Proportions. Chemical reactions involve the separation, combination, or rearrangement of atoms of different elements but no atoms are created or destroyed in the process: Law of Conservation of Matter. Dmitri Mendeleev: Russian scientist who formulated the period law, which became the basis for the periodic table of elements. J.J. Thompson: Another English scientist recognized with discovering the electron through “Cathode Ray Experiment.” Notice on the mockup of his experiment below, the cathode ray (in blue), which emits negatively charged particles, is drawn toward the positive field and is repelled by the negative field. Using an electromagnet, he then was able to determine the charge to mass the ratio of an electron, which he found to be much less than a mere hydrogen ion, an indication that this particle was very light or carried a high charge. We now know that electrons have a very small mass. Robert Millikan: An American physicist, who through his “Oil Drop Experiment,” determined the magnitude of the charge and mass of the electron—the ratio of the two was already known thanks to Thompson. Millikan misted negatively charged oil droplets (since water evaporated too quickly) through an atomizer over two charged plates: one (+) and (-). As gravity acted on the droplets, allowing them to fall, the downward force was counteracted by the charge on the ionized plates, which were manipulated to control the position of the droplets by applying electrical charge and suspending them. Once the right amount of charge was set on the plates to achieve an ideal position for the droplets, it could be assume that the two charges were equal. The charge determined was that of the electron. Ernest Rutherford: From New Zealand, this chemist/physicist is credited with setting the framework for the correct structure of the atom (protons and neutrons in the nucleus and electron on outer orbitals). This is the modern-day accepted version of an atom’s anatomy. In Rutherford’s “Gold Foil Experiment,” sheets of gold (in yellow) were bombarded with heavy, high energy beams of radiation called alpha particles. In this model, the red nucleus is (+) charged and dense, and would collide with the alpha particles, and cause them to ricochet off. But the majority of the alpha particles would penetrate the atom and pass through to the other side and be detected on a fluorescent screen. Why? 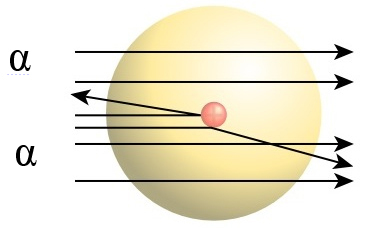 Because it was found that the majority of the atom is composed of empty space with very light electrons scattered throughout it, so that most alpha particles could plow through them and go to the other side, while a small dense center could only assure the occasional collision, similar to the likelihood of hitting a bulls eye.